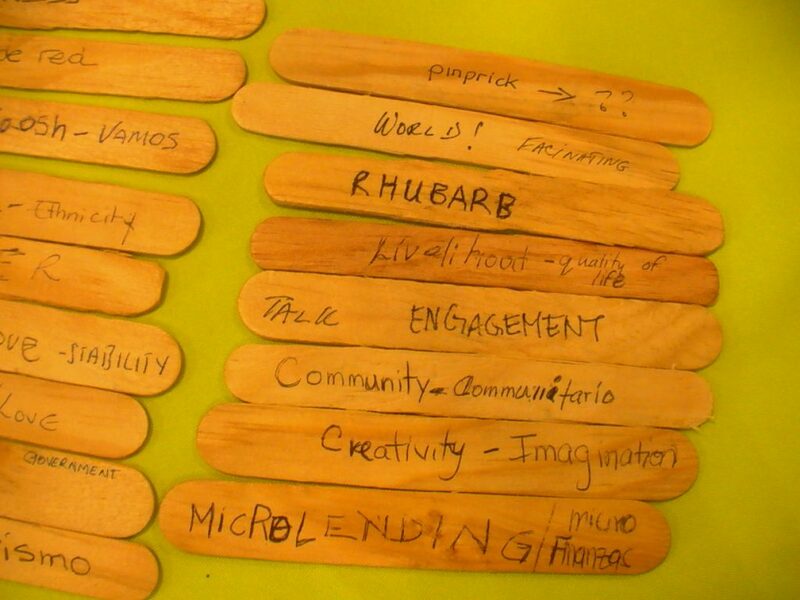 Ron uses ‘lingo sticks’ in face-to-face workshops to demonstrated a lo-fi writing and translation. The question arose ‘what is a wiki’ and we started using these sticks to show how easy it is to collaborate on translation. Plus, popsicle sticks (or tongue depressors) are inexpensive and easy to find. During a photo safari, participants would be asked a simple question, a favorite word, a favorite food or something else. They would then write down the word on the stick. Later on we’d gather the sticks, organize them in some fashion and then pass them out again for translation exercises. An added plus for the photo safari is that participants like to take pictures of the sticks!